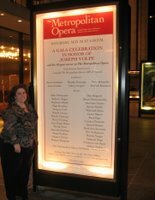 An extraordinary evening, even by Metropolitan Opera standards....I arrived at Lincoln Center around 4:45 pm yesterday. The plaza was already filling up with excited people in their finery. First, I visited the Library of the Performing Arts to view the "60 Years of Tony Award Excellence" in which Broadway window cards of the winners for the best plays and musicals from the last 60 years were displayed. Then, I wandered around the plaza and took pictures. At 5:10 I headed in to the Met for the gala celebration performance in honor of Joeseph Volpe's retirement from the Met after 42 years (I love that he began as a carpenter and worked his way up to boss of the whole shebang). Sally was already at our seats when I arrived. It was an overflowing balcony and family circle although there were a couple of empty seats here and there. The production began about ten minutes late. The scene for the opening number was the scenery for the prologue of Ariane auf Naxos. 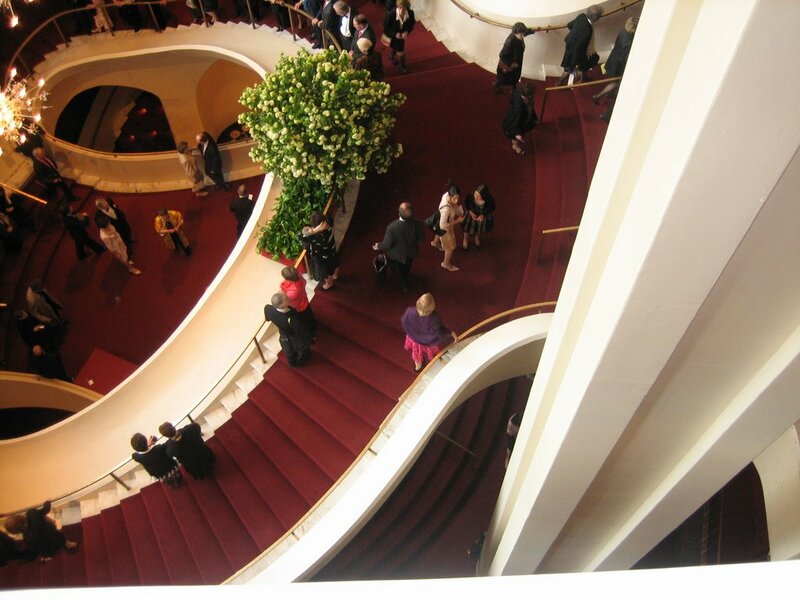 At the back of set, in front of the stair case, there was a sign that read "This way to General Manager's Office - No Backstage Personnel Allowed". It was obviously going to be a light-hearted evening. At roughly 5:40, Deborah Voigt kicked off the night with an original comedy song by Ben Moore called "We're Very Concerned". She looked smashing in a gorgeous gold satin gown. Gergviev then conducted Glinka's gorgeous Overture to Ruslan and Lyudmila. The conductors for the evening were participating in a relay race of conducting, so Peter Schneider next conducted the "Entrance of the Guest" from Wagner's Tannhauser performed by the Met Chorus. 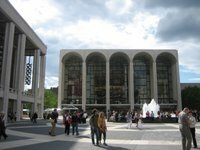 Marco Armiliato then conducted Juan Diego Florez and the Met Chorus in Rossini's Semiramide. 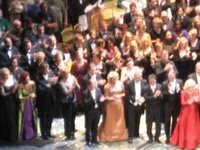 Florez was the first opera hunk of the evening and the sopranos of the chorus were enjoying their proximity to him. We continued with Rossini's L'Italiana in Algeri with "Viva, viva...Oh che muso" performed wonderfully and quite comically by husband and wife Olga Borodina and Ildar Abdrazakov. Then came the big moment I was anticipating. The Daddy of Opera Hunks took the stage....Placido Domingo sang "No puede ser" from Sorozabal's La Taberna del Puerto. Oh, his voice was beautiful. It was all and more that I anticipated. We were then treated to a couple of comedy bits. Accompanied only by piano, Frederica ("My Friend Flicka") Von Stade sang "Je cherche un millionnaire". She hammed it up and was rewarded by much laughter and applause. 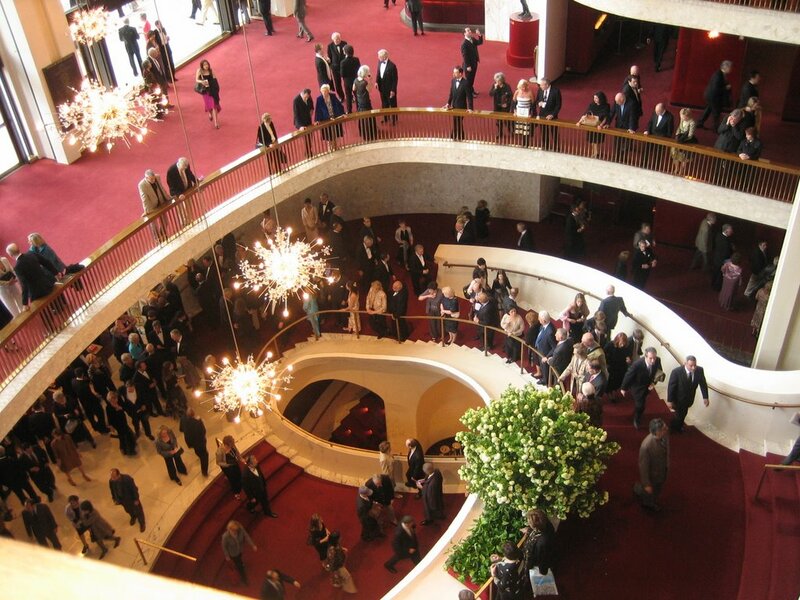 Next there was a scene change to the scenery for Act 1 of La Traviata with the curtains open and the Met stage hands on stage along with members of the Met Opera Ballet and comic Bill Irwin who had suited up as a stage hand for the evening. The stage hands wore tshirts that said "Volpe Gala". Seeing the mechanics of the scene change was thrilling, as the stage is as big of a star to me as anything or anybody else at the Met. Natalie Dessay continued the program with "Ah! Non credea, mirarti...Ah! Non giunge" from Bellini's La Sonnambula. She wore a beautiful powder blue gown. To me, her voice sounded darker than her Juliette that I heard earlier in the season, but she was still incredible. Next up was Dwayne Croft singing "Hai gia vinta la coausa...Vedro mentr'io sospiro" from Mozart's Le Nozze di Figaro. Then the gorgeous Denyce Graves, in a form fitting goldish green gown, showed off her "Can't Help Lovin' Dat Man" from Kern's Show Boat. WOW! She ended on a low note that would rival any baritone which quite pleased with herself and the audience. Renee Fleming followed with "Tacea la notte placida" from Verdi's Il Trovatore. She wore a new gown - a form fitting bodice with a full skirt, which accentuated her slim wasteline - the material of the gown seemed to be almost the color of her skin and there was a sheer black material with embroidered circle designs over that. She looked gorgeous, of course. Peter Schnedier then conducted James Morris performing Wagner's "Die Frist ist um" from Der Fliegende Hollander. At this moment, the woman behind me decided it was time to remove her shoes and scratch her feet. Needless to say, I was distracted. Waltraud Meier (Ralph Fiennes' girlfriend!) then beautifully performed "Je vais mouris" from Berloiz' Les Troyens. She made the boldest fashion statement in a purple gown that had a sort of full length bright lime green jacket over it. Ben Heppner then nailed "Morgenlich leuchtend in rosigem Schein" from Wagner's Die Meistersinger von Nurnberg. WOW! I will take time to add here that most of the gentlemen solists wore tails and looked so handsome. It was then time for another huge moment anticipated by me - Kiri te Kanawa, looking incredibly glamorous and young in a black gown, sang "Gluck, das mir verblieb" (Marietta's Lied) from Korngold's Die Tote Stadt. ANOTHER WOW! I never thought I would get to hear Kiri perform live in person. We then enjoyed a very funny video tribute to Uncle Joe. 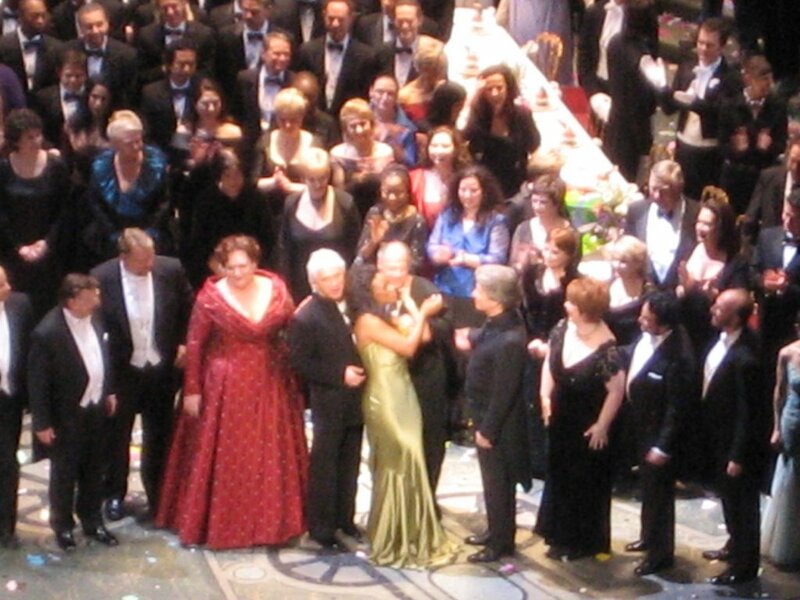 Deborah Voigt then took the stage under the baton of Valery Gergiev for "Du bist der Lenz" from Wagner's Die Walkure. This was also the first time that I heard Debbie perform live and I am hooked. Placido Domingo finished Part I of the evening with a thrilling "Granada". The intermission began at roughly 8:00 pm. and lasted about a half hour (which was much needed for the long, long restroom lines). Part II began with a bare stage. Stage hands were creating special noise effects and there was a hugh old fashioned truck driving around the stage. "Volpe's Moving Truck" was written on the canvas covering the bed of the truck. It stopped downstage and a couple of stage hands jumped out of the bed of the truck and put up stairs...and then assisted a very glamorous Susan Graham, clad in an all white sleeveless gown, down the stairs. Her entrance was classic Suzi. She killed with Ben Moore's "The Audience Song". Ben Moore does have a great sense of humor and Suzi always kills the audience with her renditions of them. 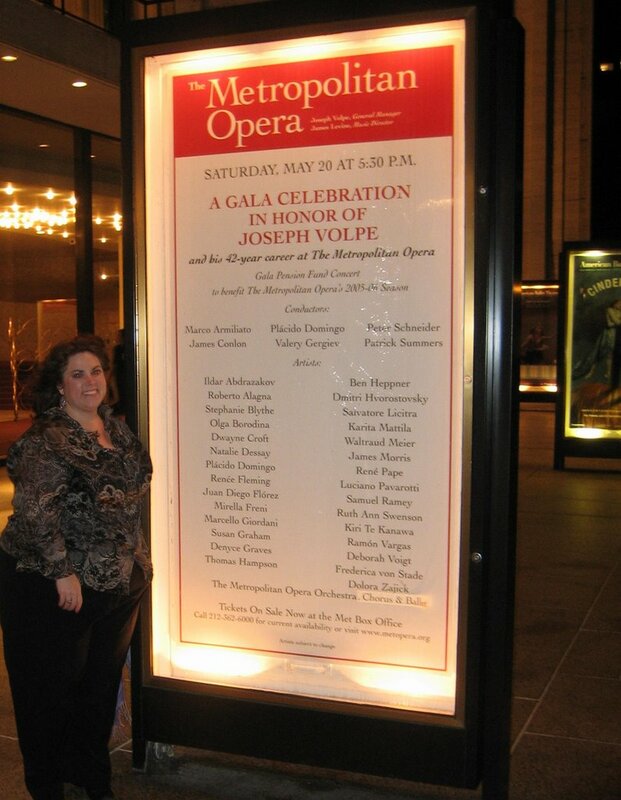 Maestra James Conlon then conducted the Met Orchestra in the Prelude to Act III of Wagner's Lohengrin. A very funny Stephanie Blythe, in a wine colored gown, then knocked our socks off with "Ah! que j'aime les militaires!" (I love soldiers) from Offenbach's La Grande-Duchesse de Gerolstein. Her fortissimo is shocking - even in the family circle! Hunky Thomas Hampson then perfomred "Mein Sehnen, mein Wahen" from Korngold's Die Tote Stadt. Where have you been all of my life, Thomas? Samuel Ramey then performed "Vous qui faites Pendormie" from Gounod's Faust. The scenery was then changed again in our view - this time to Act II of Don Carlo. "O mon Fernand" from Dohnizetti's La Favorite. OH MY GOD - HER RANGE AND POWER ARE THRILLING. 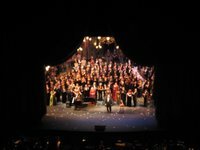 Waltraud Meier and Wendy White, with the Met Chorus, then performed "Regina Coeli, laetare" from Mascagni's Cavalleria Rusticana. 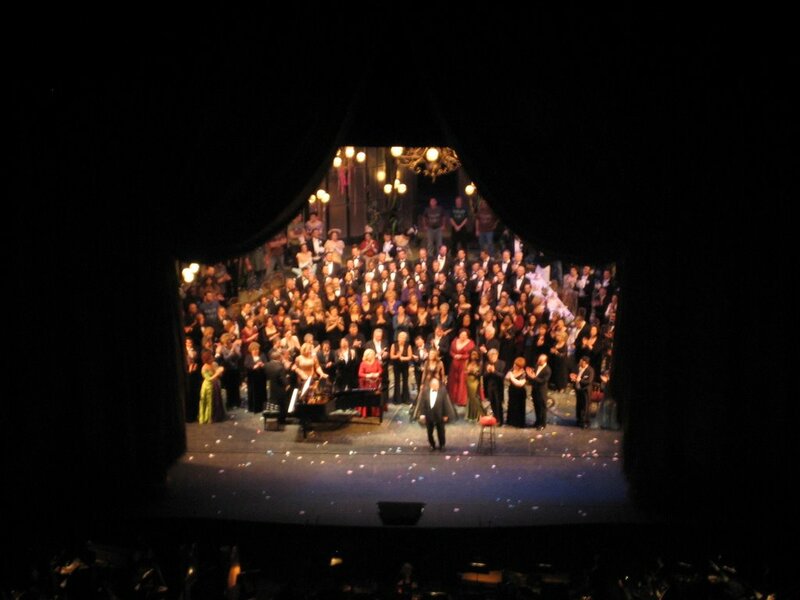 The scenery then changed again to Act II of Die Fledermaus and it was time for more comedy. Patrick Summers took his turn with the baton on the podium from Mozart's Cosi fan tutte. Kiri te Kanawa and Frederica Von Stade did some slapstick in "Ah guarda sorella". Renee Fleming, Susan Graham and Thomas Hampson then performed the gorgeous trio "Soave sia il vento". Karita Mattila, gorgeous in a lavender gown, treated us to "Vilja" from Lehar's Die Lustige Witwe. ANOTHER WOW FROM ME! Thomas Hampson joined her for "Lippen schwiegen", in a wonderful rendition of one of my favorite duets. Maestro Scnheider took the baton back for Strauss's "Eljen a Magyar Polka" and a festive performance by the Met Opera Ballet that highlighted the turntable of the Met stage. The stage turned to reveal a huge banquet - the stage was covered in confetti and confirmed that we were indeed at a marvelous party. At the banquet table were a number of the solo artist of the evening which I found at once thrilling and hysterical. Susan Graham then knocked our socks off with "Parto, parto" from Mozart's La Clemenza di Tito. She had changed into a sparkly and lacy silver top over sparkly slacks. When she finished she took a seat at the banquet table and helped herself to a glass of champagne. Baton then went back to Maestro Domingo for Ramon Vargas' thrilling performance of "Una furtiva lagrima" from Donizetti's L'Elisir d'Amore. Mirella Freni then gave a touching tribute to Mr. Volpe. She is a true legend. 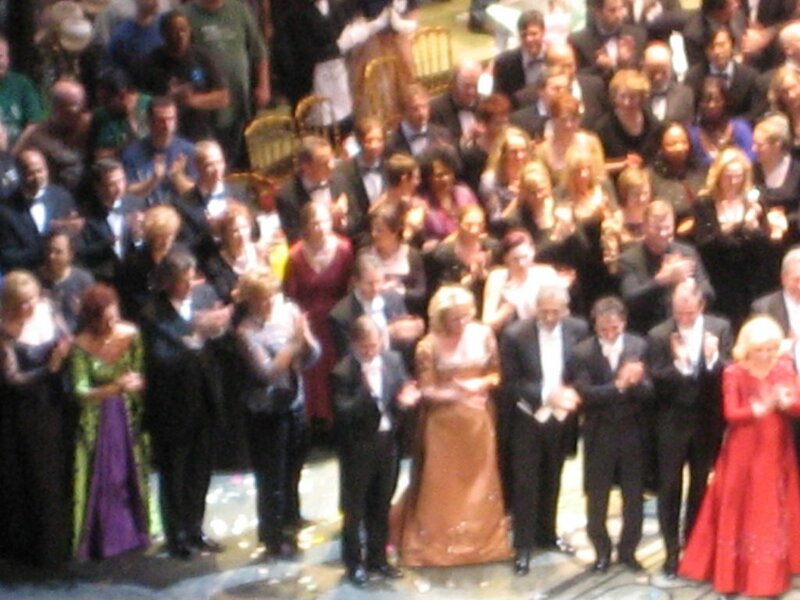 The finale to Act II of Beethoven's Fidelio was conducted by Peter Schneider. The stage was completely filled by soloists Karita Mattila, Ben Heppner, Rene Pape, James Morris, Matthew Polenzani and Rachelle Durkin along with the Met Chorus, while the "guests" at the banquet remained in their seats. I could see that Thomas Hampson took a seat next to Suzi and they seemed to be cutting up and enjoying themselves - I think they thought they were hidden. Debbie Voigt kept looking over at them laughing. It was fun to sneak peeks at them. After the finale, the stage completely filled with all of the performers and stage hands of the evening and of course Mr. Volpe - although we could find Renee! The curtains closed but the lights remained down. Finally, they opened again with a grand piano on stage and Renee surprised all and sang another number in English directly to Mr. Volpe who was placed on a stool downstage from her. It was a beautiful sight. Sally, Khaleem and I met up with Kari and our friend Sue at the freakline by the stage door. Most of the performers must have existed from the front doors to join the party upstairs, but we did see Dolora, Stephanie and Barbara Cook leaving. As we made our way up from the basement, we saw Frederika von Stade and Sally dared me to call out to her so I yelled "Bye Flika!" She turned and we all waved to each other. We then hung out on the plaza for a bit while we longed to join the party and speculated about which dances they would do and which stars would stay to boogie. We finally made our way to the Westside Diner for much laughter and discussion over many glasses of wine and excellent diner food. I don't think they had nearly as much fun at the official party as we did! Great job on the post, Sarah! By the way, the intermission was **a full hour** long! And Flicka responded to you, saying "Thank you!" or "Thank you very much!" That was a cool moment. It was very dark and quiet out there. The concert was unbelievably excellent. The broadcast (and eventual DVD) will be such a great souvenir. 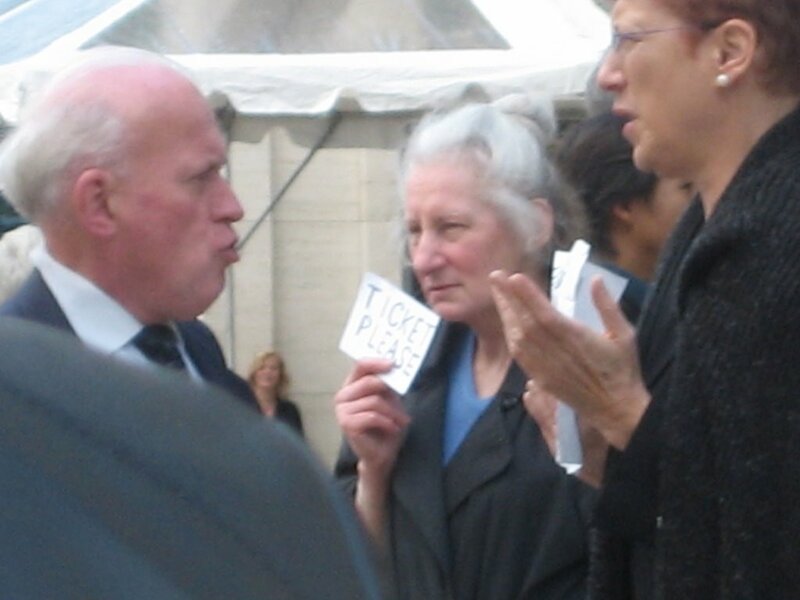 But I'll never forget how those voices sounded in the house! Fantastic Sarah! You did so well. Sounds like a fabulous evening. 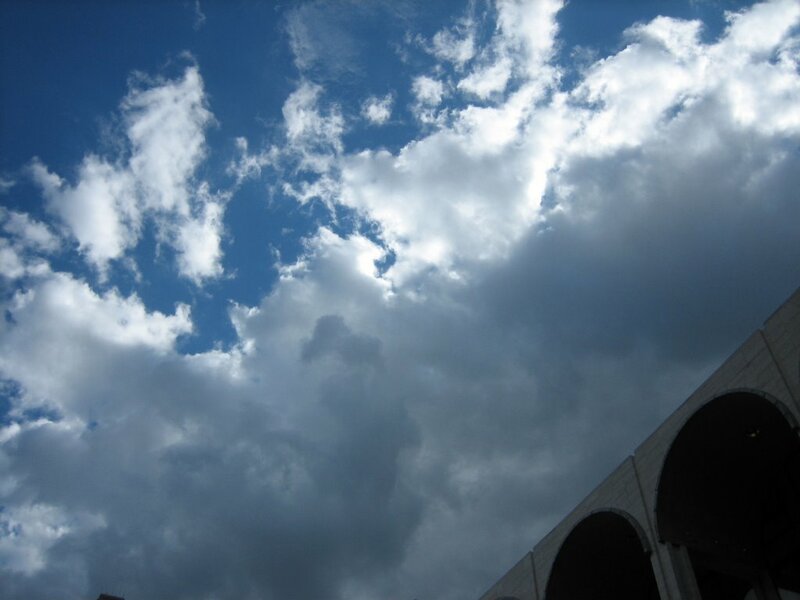 Thank you for recalling it for those of us who weren't lucky enough to be there with you. Oh, wow! I can't wait for the PBS broadcast, so I can see this for myself! I can't even imagine what it must have been like to BE there! Renee's final number was a sentimental old chestnut called, "When I Have Sung My Songs" by Ernest Charles, who published songs in the 1930s and '40s. A pronoun was changed for this performance but otherwise it was far from original to the evening. There wil be no DVD - PBS has the rights for exactly one week, then it goes into the vault - forever.